"Karmapa escaped from Tibet to Bhutan and came later to Nepal, where we met again in Bodhnath (Kathmandu). I was twelve years old at that time. There were many Tibetans, we were very sick as Tibet is very high and cold, and the food is different. Many people died. I almost died also. Karmapa gave me some medicine and so thanks to him I recovered. About fifteen people of our group (of one hundred) died within two months." "At that time everybody was extremely poor. The whole of India was quite underdeveloped then. Karmapa travelled in a big bus where he sat in the front and the rest of us in the back. About fifty of us were tulkus. The four eminent Rinpoches were there—Shamar, Situ, Jamgön Kongtrül and Gyaltsab—and many other Rinpoches. Karmapa liked humor a lot so some made jokes and some sang Khampa songs. 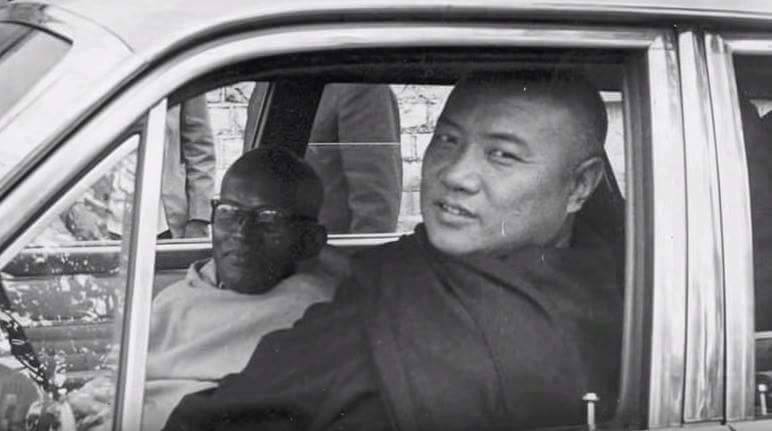 The journey was so nice with Karmapa in front laughing and joking. We had a wonderful time. As I said India was not developed then. In Nepal people were quite aware of who the Karmapa was, so when they knew he was there, they came along to receive a blessing and were very respectful, but in India it was a new experience and it was even more amazing to see the huge effect he had on people. Next, we travelled to Bhutan. The visit was very successful and the whole group (all of Rumtek) was there, including us. We spent a lot of time in Bhutan. The king was very generous. At that time, we had no contact with the Western world and no help from any other part of the world. After that the Karmapa was able to start building the monastery." Interview with Karma Dordje/Tsültrim Passang, Rumtek, 2011. Many thanks to Yeshe Jungne for the English translation.